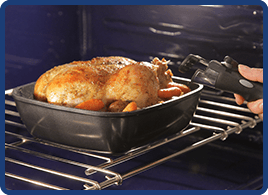 Need an extra removable handle for faster cooking?With the detachable handle you can start your food on the stove top and then finish it in the oven like the professionals. 28 cm/11" inch Grill Pan with matching lid, is designed with a ribbed base that sears food evenly and promotes healthier eating by draining away excess fat. This pan is perfect for searing meat, fish and poultry. Includes a 22cm sauté pan and soft storage insert. Casserole Pan, 22cm/8.7" with its own matching lid and felt protector is a very useful addition to your set. The Casserole Pan is perfect for family meals like stews, soups and for braising and can be used in the oven as well. Casserole Pan, 24cm/9.5" with its own matching lid and felt protector is a very useful addition to your set. The deeper Casserole Pan is perfect for larger family meals like stews, soups and for braising and can be used in the oven as well.